The Namba XXL Road Pack is designed to hold larger controllers such as the Traktor Kontrol S4, Numark NS6 or Numark NV. Well made, sturdy, smart and comfortable, the XXL Road Pack is the largest of three similar bags in the Namba range and is the perfect size for the Traktor Kontrol S4, Numark NS6 or similar controllers. The bag appears very similar to the Lil Namba Remix Backpack and the Big Namba Studio Backpack. 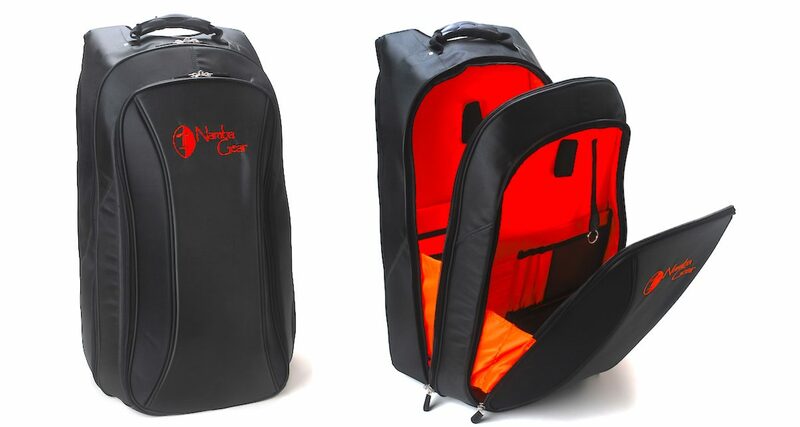 It has the same general rounded backpack looks and construction, in heavy duty and attractive padded nylon. There’s a large zipped front pocket with a mesh flap inside the door, and an internal separate compartment behind a flap, the flap itself containing pockets for pens, cards and other small items. The back section of the front compartment is meant for looped leads and the like, with a nylon Velcro loop at the top to hold them in place. 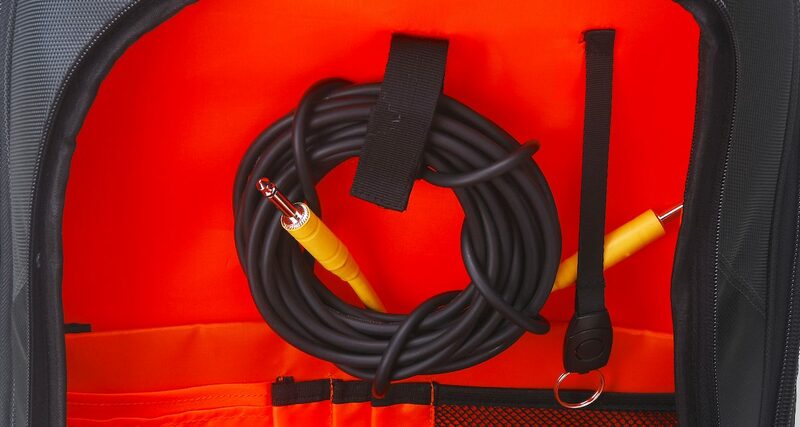 The back section of the front compartment is meant for looped leads and the like, with a nylon Velcro loop at the top to hold them in place. The large main compartment is similar in construction, but better padded and intended for your controller (up to the Kontrol S4 or even the Numark NS6 in size). However, in place of a mesh front section, it has a securely padded laptop area, which is big enough to easily fit a 17″ laptop (or other similarly sized gear, such as a Launchpad Pro, for instance, with plenty of room to spare). Meanwhile, the slimmer back flap in this compartment would be a great place for control vinyl, and again the flap itself has mesh and pocketed sections for smaller items, This main compartment again has a zip around three sides, but in this case, you can undo the hinged side flaps to open it out completely for ease of packing and unpacking. 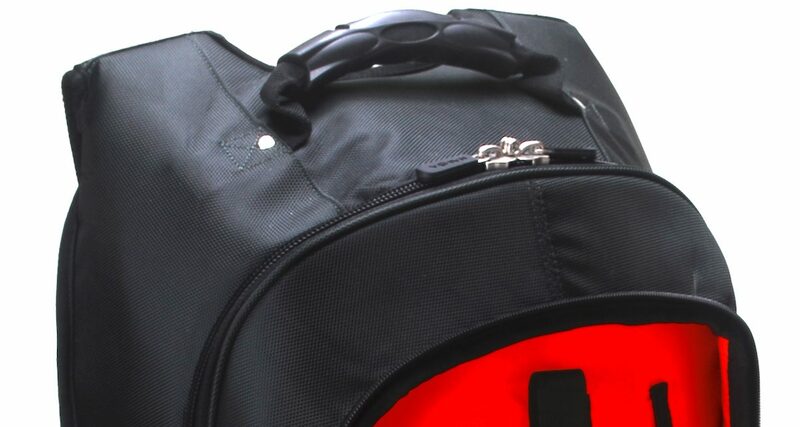 The bag has a sturdy and comfortable riveted handle on the top, and the construction is such that even when it is fully packed, there’s usually a bit of room in the top of the main compartment for tucking an extra item into (headphones for, instance). There are three sturdy stitched-on large rectangular feet allowing the bag to stand up on its own depending on how it is packed, and the back is heavily padded with breathable mesh and thick shoulder straps that have a horizontal strap to go around your waist once the bag is on; great for using on a bike, for instance. The right-hand shoulder strap has a small “secret” zipped compartment built-in. Here’s where we started spotting the subtle differences from the smaller packs. The main difference is the way the bag deals with the extra size and inevitable extra weight of the gear it is intended to carry. The backpack straps are wider and more padded, to start with, but also there´s a more involved system of spreading the weight across the top of the shoulders, with stitched-in supports across the whole shoulder area. We also noticed that there is a stiff piece of material at right angles to the main pack that sits from front to back over the top of each shoulder, with the straps actually stitched to the back of this and not to the pack itself. This stops any pinching of the shoulder when the pack is full and heavy, and presumably reduces strain on the stitching too. It’s a good addition to the design of the smaller bags to take into account increased weight in a bigger bag. Apart from these differences, the things we reported in the two other reviews linked to above also hold true for the XXL Road Pack, and as we don’t have a video of this one (long story, involving customs officials and dodgy shotgun microphones…), if you’d like a better sense of what this bag feels like, watch the videos in those reviews, as they’re quite similar. If you’re looking for a heavy duty backpack for frequent use to hold a larger controller of the size of the Numark NS6 or Traktor Kontrol S4, this should be on your shortlist. It’s sturdy, good looking, well made and has a little bit more character than black bags, assuming the cheerful colours and “tribal” Namba logo make you smile. Note the way the straps are designed to “stick out” at the back to stop the bag pinching your shoulders when fully laden. The only thing we found ourselves wishing it had was some kind of additional small pocket, as most similar bags have. I am not sure how it could be done without breaking the streamlined styling, but in a bag, this big, somewhere to tuck wallet, tickets and so on without opening the front compartment would have made it even more practical. However, that’s a niggle. Overall it offers good protection for your gear while remaining lightweight, thanks to the wired front compartment and good padding around the main compartment. The oval design with just two pockets means it stays smart even when fully packed – and just as importantly, remains comfortable thanks to those improved straps and the way it works across your shoulders.